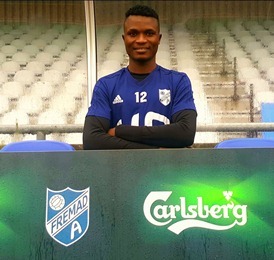 Remo Stars FC have confirmed the departure of Rasheed Sodiq Anthony to Danish club Fremad Amager. The solid defender, who will wear the no. 12 shirt, signed a season long loan with a buy out clause for the First Division club after completing his medicals and was unveiled to the media in Denmark. Rasheed joined the Sky Blue Stars at the commencement of the 2016/2017 Nigeria Professional Football League (NPFL) season but played with Remo Stars Feeders in the Nationwide League scoring couple of goals before making his full debut for the senior side against Rangers International in Match Day 30 in the NPFL. Before his departure, he became a regular part of the team and scored his first goal of the season for the Sky Blue Stars in Match Day 6 against Ikorodu United at the Teslim Balogun Stadium, Lagos and got his second in Match Day 8 against Crown FC at the Soun Stadium in Ogbomoso.